HAVANA, Sep 6 2013 (IPS) - In nearly all of Latin America, illegal abortion is a serious public health problem. But in Cuba, where abortion is legal, it is being overused by teenagers. Three times as many teenagers terminate their pregnancies than carry them to term. Many pregnant 15 to 19 year olds have already had one or more abortions according to their medical histories, researchers find. 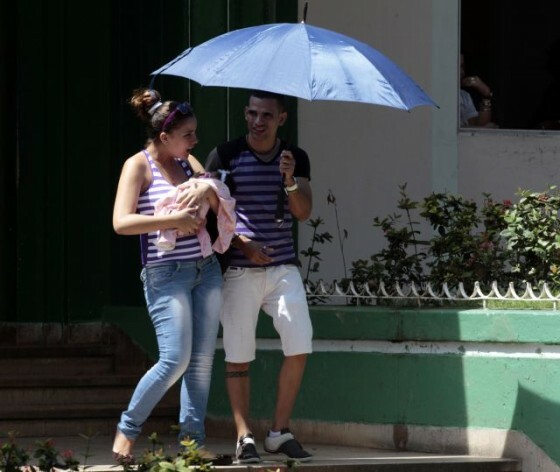 Having 76 percent of pregnant teenagers electing to abort “is a public health problem,” said Dr. Jorge Peláez, vice president of the Cuban Society of Obstetrics and Gynaecology. Abortion “apparently avoids one problem, but it creates many others. It will never be the solution to teenage pregnancy,” Peláez told IPS. The difficulty is the rising rate of underage pregnancy in this Caribbean island nation. In 2006, 45 per 1,000 young women aged 15 to 19 gave birth. By 2012 the rate had leaped to nearly 54 per 1,000. In the region, the average rate is 80 per 1,000. “I made a mistake with my contraceptive pills. I talked to my mother about it and we decided the best thing to do was to have the baby, although other people recommended having an abortion,” Daniela Izquierdo, who had a child at the age of 16 and has just returned to secondary school, told IPS. In this country with a very low birth rate, teenagers account for 16 percent of total fertility. Abortion was decriminalised in Cuba in 1979, although terminations were already being carried out in medical institutions with the authorisation of the health ministry since 1961. As well as being an important victory for women’s rights, safe abortions have reduced the complications and consequences of unsafe backstreet abortions. Free abortions are available on demand to any woman in hospitals and clinics in Cuba. Health personnel evaluate whether the operation can be carried out in each case. Girls under 16 need the consent of their parents or legal guardians and are provided with special counselling. Over time, abortions became a means of regulating personal fertility. “This is a problem that is recognised by the authorities, and is extremely complex to solve,” Peláez said. A study of 22 pregnant teenagers in the Havana municipality of Diez de Octubre, published this year by the University of Havana, found that eight of them had had one or two previous abortions. Another study this year, in the Havana municipality of Playa, found the same result in nine of the 24 teenagers studied. It is the pregnant teenager and her family, especially her mother, who deal with the problem and have the last word on continuing or interrupting the unwanted pregnancy. The fathers of the babies, in general, do not feel they have an important participation in decision-making, and do not feel responsible for their partners’ abortions. This is the finding of an article published last year by doctors Luisa Álvarez and Nelli Salomón in the Revista Cubana de Salud Pública (Cuban Journal of Public Health). The authors say a gender perspective is needed to prevent early pregnancy and abortion. “Efforts are being made to reduce the practice (of abortion) and increase contraceptive use, but it is necessary to delve in depth into the views of women and their partners in order to change attitudes, to achieve greater involvement of both members of the couple in their relationship and improve sexual and reproductive health,” they say. Young women, for their part, are more concerned about social stigma than about the health consequences they may suffer. “It can cause infertility, among other risks,” he said. Society, especially the media, must show these dangers, “without demonising” the practice, he said. Families can play a decisive role by providing guidance on contraceptive use. Although each case is different, the most suitable method for young people is a combination of condoms and hormonal contraceptives, whether pills or injections, Peláez said. Teenagers and young women account for 40 percent of all unsafe abortions worldwide, according to the United Nations Population Fund (UNFPA). In Latin America and the Caribbean as a whole, teenage pregnancy is a major problem: 10 percent of young women aged 15 to 19 are mothers. Abortion is only legal in Uruguay, Cuba and Mexico City. Unsafe illegal abortions and poor quality health services are the main causes of death for girls in this age range.